Our electric mitre saw went on the blink. It was sparking like crazy, and on closer examination, it had lost a copper segment from it’s commutator. It was a decent enough saw. Not quite a cheapo one, but not quite a professional one either. 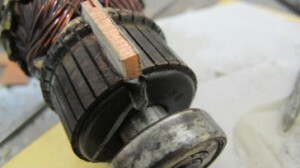 A search on the ‘net revealed that a new armature assembly would be over half the cost of a new saw. Beyond economic repair in other words. It would be a shame to trash a decent saw for such a small fault. So we’re trying to fix it by making a new copper segment. First job was to measure the size of copper required. Started with a chunk of 10mm copper cut from an old busbar. The copper piece was mounted (by plumbers soldering) to a steel carrier. This could then be put in the lathe for turning down to the correct thickness. Having turned down from 10mm to 3mm, the copper segment was detached from the carrier and trimmed close to size. Holes were drilled to allow epoxy resin to grip the piece when inserted into the armature. Tape was applied to the sides to space the piece from the existing segments. The tape will be removed later. The new piece was epoxied into place and allowed to set. Next stage will be to put the whole armature assembly in the lathe, and turn the new segment down to the same size as the existing ones. Then connect the wires up and reassemble the motor. Tune in at a later date to see if it worked, or if it was one of those “epic fails”. This was written by gary. Posted on Saturday, May 2, 2015, at 10:41 am. Filed under Tools. Bookmark the permalink. Follow comments here with the RSS feed. Post a comment or leave a trackback. this looks very cool! i worked for a few years in a factory making DC brush motors, would be great to chat to you about this if you’re interested. Sure. Drop in sometime. Next Saturday the space will be open most of the day till very late for our open social. Try to drop in.